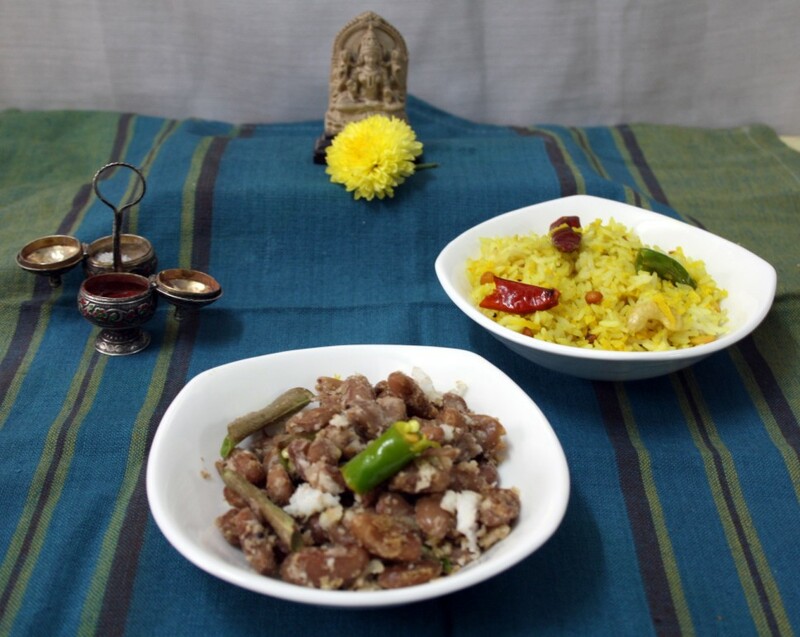 For the Navaratri Special Dishes on day 2, I decided to make Nelikai Sadam and Rajma Sundal (South Indian Style). The Neivedyam to be made today was to be sour. Normally lemon Rice is prepared, so seeing that I had Amla at home, I decided to make that instead. Not only is amla very healthy, this version gets done very quickly. I have already blogged another version of Usirikai Annam. Today’s method is much simpler to make for a quick neivedyam. Coming to the sundal part, I got couple of varieties in Rajma for making the sundals. 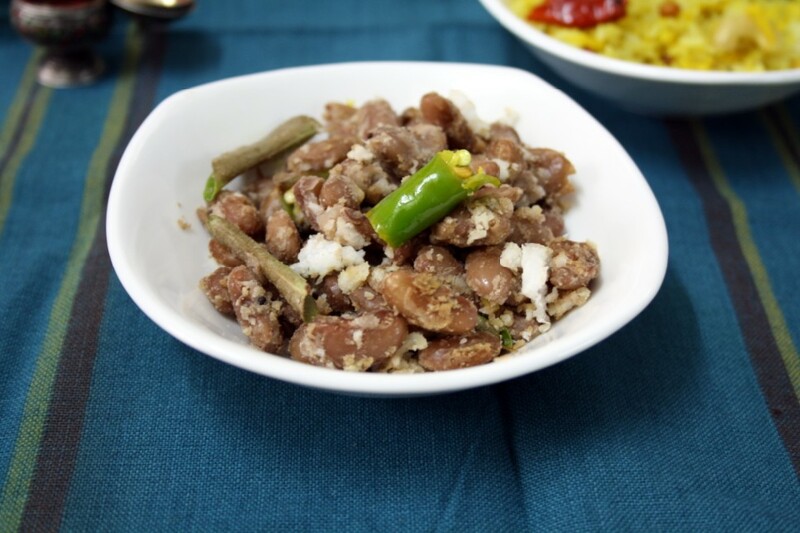 Today’s Sundal is made with Spotted White Rajma. It’s been pretty hot the past couple of days, and without a warning it poured literally this morning. So much downpour that the roads got blocked and so much traffic everywhere. Konda had her exams today and her father had to drop her, wading through the rain. Seeing that it was raining so heavily, Peddu and Chinnu were so happy. Before I could even think about it, they got drenched and had to be warned. But then I know how much fun it is. I really had to get the neivedyam ready much faster as I didn’t have enough time. I was happy that I soaked the rajma overnight. 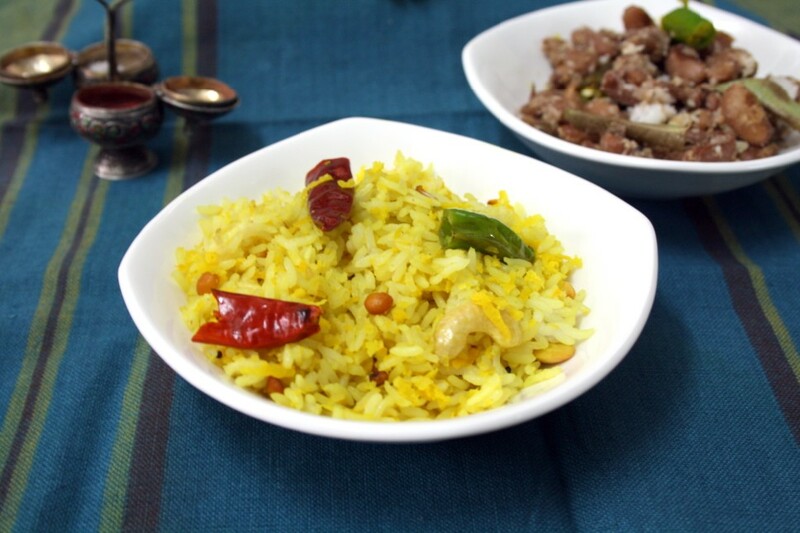 For making sundal, it is pretty much the same with most lentils. We do have couple of varieties that you can make to add flavor. 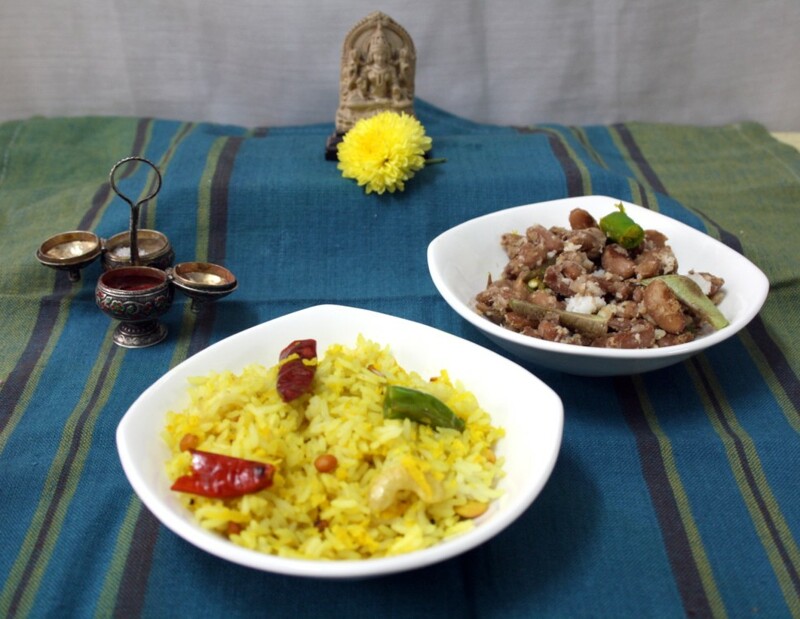 Though the simplest form of making sundal will involve seasoning with Mustard, curry leaves, coconut gratings. Wash and soak Rice for 15 mins. Pressure cook till done. Take 1 cup cooked rice and allow to cool. Grate the Amla and keep it aside. In a non stick pan, heat oil add mustard seeds, Urad dal. curry leaves, cashew nuts, ground nuts, 1 inch chopped green chilies, dry red chilies. Saute well. Add turmeric powder and salt. Combine everything together. Then add the grated Amla, mix well and simmer for couple of minutes. Finally add the cooked rice and toss everything together. Wash and soak the Rajma overnight. Change water couple of times before pressure cooking. Take the drained Rajma in a pressure cooker, add enough water to cover the lentil. Cover with lid and pressure cook till done. Make sure you don’t overcook the lentil as it tends to get mushy. It should get done in 3 whistles. If water is still there, you can cook it open, add salt. Cook till water is all evaporated. Heat a non stick pan with oil. add mustard seeds, Urad dal and hing. Saute well. then add the curry leaves, green chilies and add in the cooked Rajma. Combine everything well. Simmer for few minutes, finally garnish with grated coconut. Both the prasadams were delicious. I know Amla rice is going to be regular one from now on. Hope you enjoyed today’s post, come back tomorrow for Day 3 celebrations! Beautiful and inviting dishes together..